This is a very rare association of fossils. 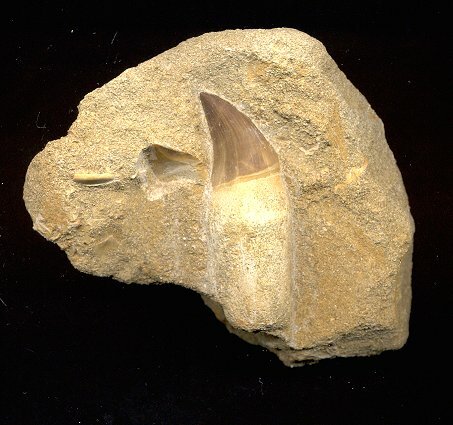 There is a large Mosasaurus anceps tooth and a Squalicorax shark tooth preserved on the same rock. The Mosasaur tooth is large and in excellent condition - the tip of the tooth is intact as is the root (RARE!). The dark brown enamel of the tooth is also beautifully preserved. The Squalicorax tooth is mostly complete, including the tip and sharp serrations. Both teeth are naturally embedded in the block of sandstone that also contains other fossil fragments. This is a very unusual pair of Cretaceous teeth fossilized together.